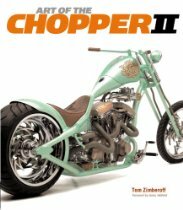 Most motorcycle enthusiasts with an appreciation for custom motorcycles and choppers are familiar with the book Art of the Chopper by Tom Zimberoff. This is an outstanding book featuring first class photography by expert portrait photographer and journalist Tom Zimberoff. Tom features twenty of the hottest custom bike builders in this book. 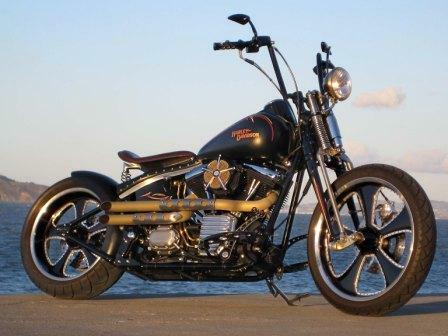 Each builder has a chapter that starts with a fantastic B&W portrait photo of the artist and is followed by an editoral and then features color photo’s of the most awesome pieces of custom motorcycle chopper bling art on wheels you ever seen. 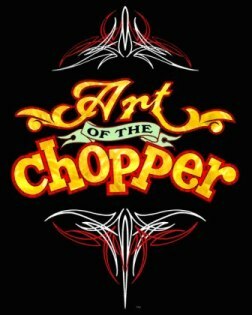 Art of the Chopper was so successful Tom followed up with Art of the Chopper II. In total there are 41 talented builders/teams featured in these two books which are the best selling books about custom motorcycles ever published. I met Tom a few years ago at a motorcycle show in Virginia and he was kind enough to sign my copy of AOTC. Recently Tom came by and left a comment on a post here at Road Captain USA and I leaped at the opportunity to interview him. 1. Tom can you tell me how you got involved with motorcycling and photography? Let me compress a long story into something you can digest in one sitting. Starting at age nineteen, while I was still in college, I began a successful career as a photojournalist and, later, as a commercial photographer. 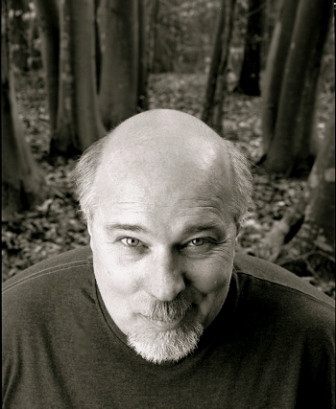 Early on I became an advocate for photographers’ rights; i.e., protecting business prerogatives by educating photographers and their clients about copyright-licensing issues (i.e., intellectual property) and the importance of establishing a paper trail of business documents. In addition to promoting a higher standard of business practices, I was concerned with promoting effective marketing skills. I believe all photographers will increase their effectiveness in these areas through the use of computer automation. No one becomes a photographer because he wants to start a small business. They all want to support their art instead. Nevertheless, anyone who wants to become a “professional” photographer can simply hang a Nikon around his neck and jump into the marketplace. The problem with that is, without any knowledge about how to ethically, competitively, and profitably price your work, you undermine the efforts of those who worked hard to establish best practices before you came along. By under-billing and consequently watching your business fail, every new generation of tyros is responsible for ratcheting down prices year after year. When the Internet came into play in the mid 90s it seemed obvious to me that an opportunity existed both to help photographers make money and to make money myself doing it. First, I realized that while you can’t download a bouquet of flowers, prescriptions drugs, automobile parts, a trombone, or a suit of clothes from the Internet, you can certainly download photographic images. Voila! I realized that if I could create the means to both aggregate and interconnect photographers on the Internet, I would be in a position to license and distribute their images. I created software that rapidly became indispensible to every photographer who tried it because it boosted their business skills, helped them make more money, and kept their businesses profitable. I automated the business paper trail so photographers could spend less time behind a desk and more time behind a camera. I quit taking photo assignments in 1993 and virtually locked myself in a room for a couple of years to teach myself how to write software code. I created PhotoByte, which thousands of photographers still use. The idea was, when the number of photographers using my software reached critical mass, I could flip a metaphorical switch and they would all be on my network. I would share the licensing revenue created by tens of thousands of other photographers. I retailed a simple version of PhotoByte as a proof-of-market concept for several years until I aquired partners who helped me raise nearly eight million dollars in venture capital to start a “real” company. The problem is that founders like myself are often marginalized quickly in such tech deals. When I lost control of my company, those on the board of directors who thought they knew more about the habits of photographers than I do changed the direction of the company. The company failed. I lost my shirt. I needed, quickly, to find a way to make a living. That brings me to motorcycles. Having already published a book about the business side of photography (Focus on Profit; Allworth Press), I knew I could write. (The book is used as a text at colleges throughout the country.) I couldn’t go back to shooting. It had been ten years, and I lost touch with all of my contacts in that industry. But I still knew how to shoot. And I have always loved motorcycles. I thought I might be able to put together a book about my passions, combining photography, writing, and motorcycles. I got lucky. 2. How did Art of The Chopper come to be and how long ago did it first get published? 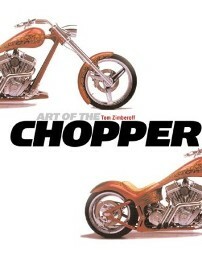 The first of two volumes of “Art of the Chopper” was published in October 2003. Volume II was published in October 2006. 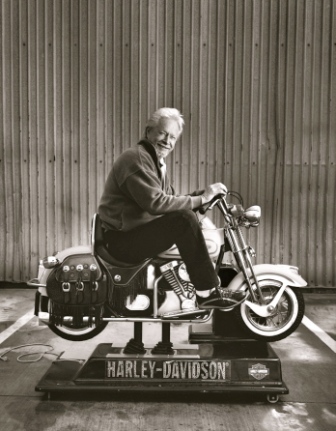 3. Who is the most interesting chopper builder to work with? That has to be the late Indian Larry. You can get my take by reading his chapter in the book, I think. 4. Can you tell us what makes a particular motorcycle photogenic compared to another? Photogenicity, if I may coin a word, is not my criterion for photographing motorcycles. In fact, photographing them is entirely incidental to their celebration as artworks. My photographs are merely illustrations, as they are suitable for inclusion in a catalog of these objects d’art. However, I can speak to the criteria that make a motorcycle art. 5. 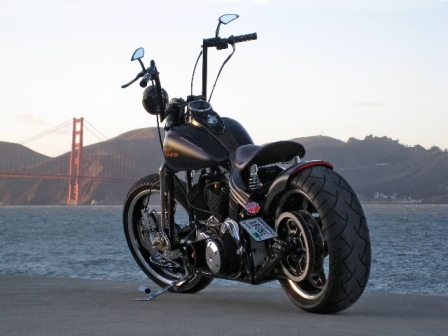 What types of motorcycles do you like to photograph? Beautiful ones. What is my criteria for beauty? Well, we have to begin with a conceptualized, hand-made machine that, in my mind, exemplifies a convolution of form and function. In other words, form does not follow function nor vice versa. It can work as a sculpture as well as a means of transport. It is literally a vehicle of self-expression. No single aspect of the bike conflicts with any other, neither visually nor operationally. It must also exhibit a combination of flamboyance and minimalism; very hard to achieve and nearly impossible to quantify. Mine are certainly objective opinions. And (with a wink and a nod) I am always right when I identify one bike as a work of art and another as, well, a nice-looking bike that is derivative of someone else’s work — or just a piece of crap. It is my job to distinguish between the two and to proselytize those differences. I am a critic. I don’t see anyone else in the industry taking on that role. 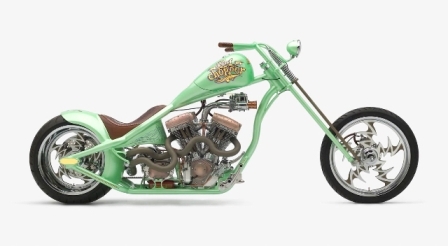 And, for the sake of convenience, I call an “art bike” a chopper, whether it sprang from a Ducati or a Harley, or whether it sprang from scrap metal and one’s imagination. Finally, it’s not so much that I enjoy photographing them. I do it simply so more people can see them. It’s better that they should be publicly exhibited; hence Art of the Chopper at the William J. Clinton Presidential Library & Museum earlier this year and to be shown elsewhere in the future. I do, however, enjoy photographing the artists who create choppers. I enjoy making portraits. 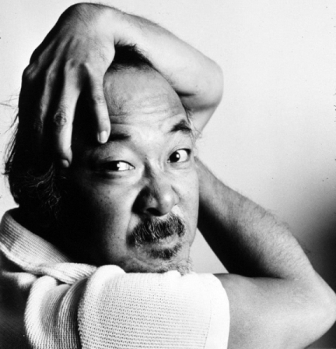 Incidentally, it was fun to see a picture of Mister Miyagi wielding chopsticks on your blog. (You should credit the photographer. And, perhaps, you owe him a small licensing fee.) The late Pat Morita was a good friend of mine. My portrait of him hung over the bar at the Imperial Gardens restaurant on the Sunset Strip in Los Angeles for many years. Alas, both Pat and the IG are gone. 6. Do you ride a motorcycle? What kind of bike do you ride if you do ride? I have a customized H-D Cross Bones. I emphasize the word customized as opposed to custom. Unfortunately, it was vandalized and will soon undergo a metamorphosis into a completely different design. I want to buy a Road King and a Ducati 1000S. 7. Do you have any new projects coming up or that have just come out that you would like to tell me about? I am working on a third and final volume of Art of the Chopper. My exhibition of AOTC opens at the Appleton Museum of Art in Ocala Florida in October this year. It will run through January 10, 2010. The opening coincides with Daytona Beach Biketoberfest, just a few miles down the road. 8. Are you making any appearances this year at motorcycle events? Where will you be if my readers would like to come out and meet you? I have no appearances scheduled until Biketoberfest. I will certainly be in Daytona Beach and in Ocala for the exhibit opening.